Quite a while ago I converted my D2 (with a larger lift) from a rotoflex to a uni-jointed rear tailshaft. I did this because I needed the strength for how I was setup with tyres and how I was driving it. 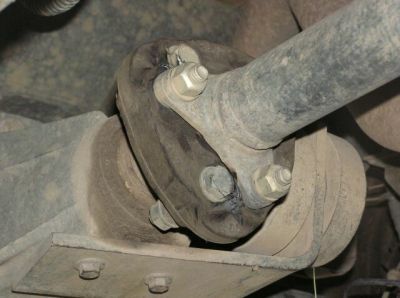 Along with the uni-jointed rear tailshaft came some vibrations at about 105+km/h with a regular and a DC rear shaft. I have a view to change back to a rotoflex to get rid of the vibrations again but needed a stronger rotoflex - this may be useful for others that have broken rotoflexs but dont want a uni rear tailshaft. I'd seen a lot of road cars now use these, many of them high output engines which got me thinking and finally tonight researching. Here is what I've found and but not yet tried. 96mmPCD 12mmx6 bolts ID50mm, OD132mm, 30mm wide. 96mmPCD 12mmx6 bolts ID50mm, OD132mm, 35mm wide. 96mmPCD 12mmx6 bolts ID49mm, OD133mm, 35mm wide. I dont expect the thicker rotoflexs to cause problems with the reach on the centralising spigot or the tailshaft lengths due to the slip joint and I'm not sure re standard bolt lengths. With some more searching using GKN part numbers, it seems people have been on to this already! Here is the low down, especially for the fans of GKN parts. GKN 35mm Rotoflex to suit GKN P/N:249537. 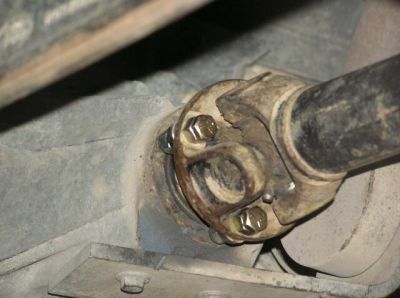 To do this the bolts also must be changed from M12x65 to M12x70 with a recommendation of high tensile and zinc plate. Apparently, apart from the bolts there are no other problems from what I can read. 1) Genuine LR part has 'GKN' '249782' 'GAG1' moulded (molded) into the rubber. It is relatively flexible, you can grip two of the moulded pads and bend the coupling. There are voids in the heavy pads that go all the way through the coupling. 2) Pattern part, sold by Allmakes, no identifying marks at all, dimensionally similar to the LR part, there are voids in the heavy pads but they are not all the way through. 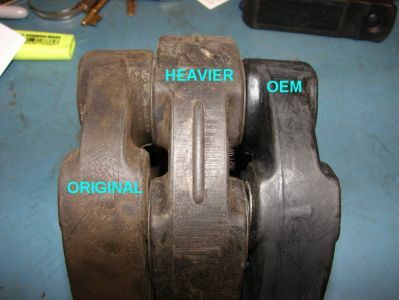 The coupling is almost solid and not able to be bent by hand. 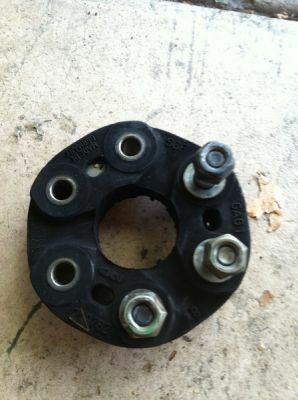 3) Heavy Duty part, sold on ebay, is made by GKN and has 'GKN' '249537' and 'GAJ1' moulded (molded) into the rubber. It is 5mm thicker than the standard coupling, has no voids at all in the thicker pads and is not able to be bent by hand. The ribs between the pads are increased thickness as well. All three have the arrows for marking the bolts, the Allmakes one looks as though they have used an actual coupling to make the mould with, the arrows are not very well defined, while the GKN ones are sharp and clear as you would expect. 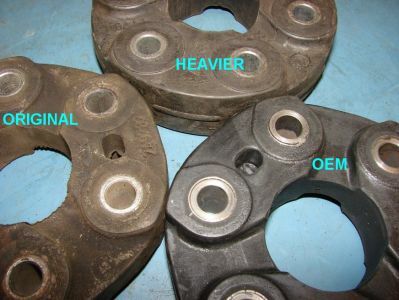 The heavier coupling requires longer bolts, stock bolts are not long enough to fully engage the locking portion of the nuts. Stock bolts are M12 X 65, you need M12 X 70 to use the heavier coupling. They will just fit in behind the pinion flange. Considering how relatively soft the LR part is, I'm not surprised that the heavier duty coupling has lasted so well on my own vehicle, but we do go off-road as such, but do tow a lot. My own coupling was checked recently, still solid with no cracks, and I have a spare, so won't be looking to change anything soon. The lack of ID on the Allmakes component does suggest a 'Far East' source, but is seems solid enough to do the job. Hope this is of some use to anyone looking at spares. Ensure the rotoflex is reinstalled in the correct direction - it looks like it has different characteristics or strengths depending on how it is installed. 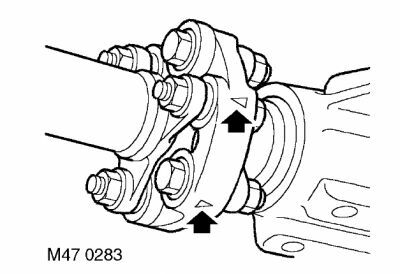 The arrows on the sides point to the pinion flange or the tailshaft flange - dont clock everything around by a bolt hole otherwise everything changes, the compression parts of the rotoflex go in to tension and the tension parts go in to compression.